'Tis shocked, appalled, and outraged we are, here at The Chant, to learn of this barbaric practice of throwing Tuna as a "sport." Rather explains why Tuna's posts are so few. All that travel to the "land down unda, the land of wonda," has to be tiresome. Not to mention getting "tossed" while down there. I mean, I know that Tuna was in the Navy and all, I remember Lex's posts about port visits in Australia, but to make it a sport? What? It's not what I think? Oh, this is actually a "thing" in Australia, based on fishermen returning to land and throwing their catch ashore? The Daily Mail has it's own amusing take on this fishy contest (hey, they started it, and that's a different video than Peter posted previously, sigh, I know...). 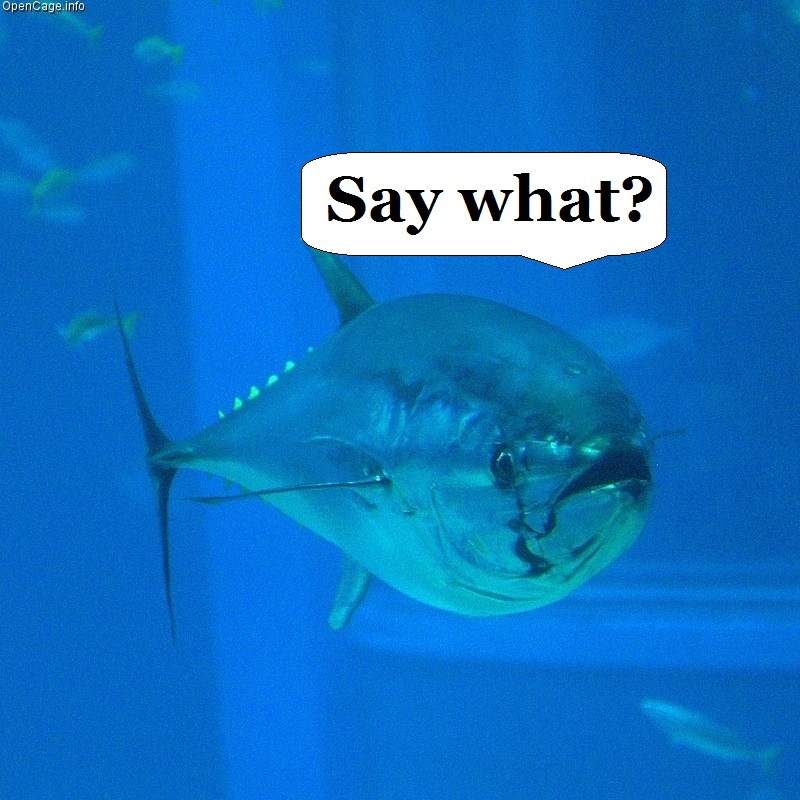 So Tuna, care to comment? Spent Sunday night tossing and turning, sleeping fitfully whilst fretting about mine warfare. No, really. Naval mines to be precise. Let me just say this, I hate mines. Except when it's me laying them. Don't ask, I've played too many war games and simulations over the years, affects the brain it does. Anyhoo. Monday, up early I was, 0530. Couldn't sleep and the feline staff suggested that I should feed them, "seeing as how you're up and about already." What the heck, might as well. So I did. Consequently I arrived at work a bit earlier than normal. Well, 15 minutes earlier, round about 0715. A gray day, cold wind coming in off the Atlantic made me shiver as I dismounted Big Girl and locked her up. 'Twas then that I noticed movement to my left flank. Over by a stand of trees near the parking lot. Not far from the front of the building. Right about where that picnic table stands on the far right of the photo. Four deer, two of which looked like yearlings based on their size. Two larger ones, I assumed they were both does (the female of the species Odocoileus virginianus, the males are known, round these parts anyway, as bucks). I assumed because by this time of the year the bucks have shed their antlers. While there are a number of young males on the property, the big fella, the head buck in charge of the herd seldom comes anywhere near the open. 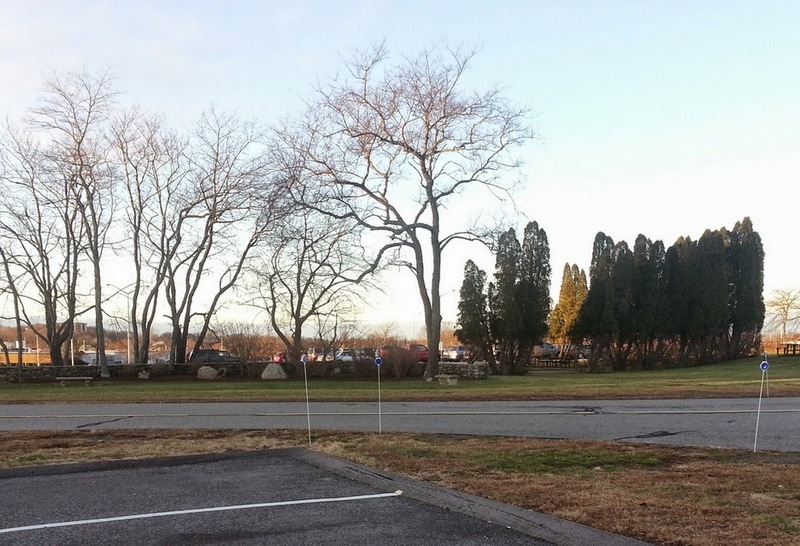 He can be seen on the edge of the fields to the east of the facility, which are surrounded by rather tangled woods. We have a sizable herd of white-tails on the property. No natural predators except when they jump the fence and get hit by cars on the main road. Juvat is familiar with the attack patterns of the white-tail. Security once found that someone had cut a hole in the fence back in the woods for to go a-hunting on company property. Those fellas were sore surprised to discover that the Federal government looks askance at folks who break into facilities where gubmint work is being done! So yes, four deer, all of whom were rather surprised to see humans dismounting their vehicles and proceeding to work. 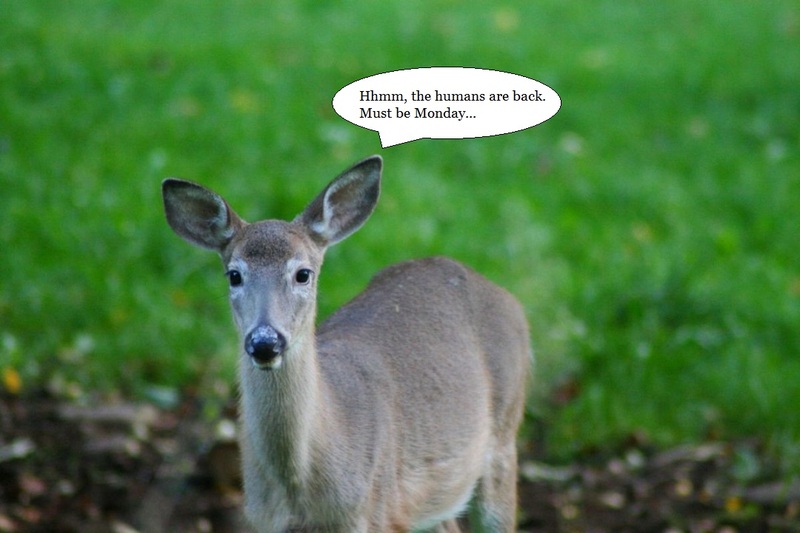 Perhaps they figured that Monday was a holiday. Maybe they just lost track of time. At any rate, it was an awesome thing to see on a Monday morning, out of the ordinary and all. It was also great fun to see just how fast a white-tail can run when they want to disappear into the woods! I was kinda thinking the other day about my lack of "political" posts lately. By choice. I see nothing to be gained by ranting and raving about things, particularly the antics of the political class. A friend or two has lately indicated that they were "refraining from Facebook" for a while. Well, I won't do that. I keep in touch with my kids and grandkids over Facebook, videos and photos of the latest doings. I keep up with old buddies from my Air Force days and I belong to a group of folks who have a great deal in common with each other. We're mostly conservative but there are a couple of folks of a liberal bent who keep us honest in our views. I have pretty much disengaged from political discourse. I stay informed but won't engage unless it's absolutely necessary. Which is seldom the case. One last thing, I just wanted to mention the music I'm listening to these days. Foo Fighters. There, I said it. I don't knowwhat their political leanings are and I don't much care. They entertain me. A lot. And you can dance to it. Which I do, when no one's looking. My dancing leaves quite a bit to be desired. Hhmm, I might actually be worse. Though, to my credit, I once invented a dance. I called it The Tomcat, it involved dancing about the periphery of the dance floor with my arms spread wide, then I would dash across the floor, sweeping my arms back as I did so. Yeah, F-14 Tomcat, not the feline kind. Why yes, I did do my own sound effects. Was alcohol involved? Of course it was. You might ask yourself, "What did The Missus Herself think of your new dance?" OK, I'm not a big fan of poetry, not against it mind you, just not a fan. Most of the poetry I'm familiar with is the lyrics of several Fighter Pilot songs. Most definitely not appropriate for Sarge's delicate ears. So, you ain't getting poetry today. I thought about a food posting based on a story our DIL told at brunch today. Seems one of my former students, who went to Med School, got married, has a kid and another on the way and works in the Urgent Care Clinic in town (i.e. She Done Good! ), volunteered to provide a meal for the Men's ACTS retreat recently. However something, based no doubt on all the factors outlined in that sentence, caused her to forget her commitment until the last minute. Reaching deep into her culinary repertoire, she produced a sumptuous meal that was well appreciated by all. She called it "Nut Pate with a grape reduction compote served on a Brioche". But, nah, that ain't it either. Based on a comment of one of Sarge's posts last week, I thought about talking about my terrain walk of the Vicksburg battlefield with the other 49 Students in my SAMS class. Quite interesting. Given that I was one of 3 non-Army students (1 Navy O-4 Logistician, 1 AF O-4 Logistician and Moi), we were a little out of our league. The school had assigned roles to each of the students in the class based on their MOS. So an Infantry guy was Grant (He's now the current USARPAC Commander, he was my roommate on these trips and running buddy. (reminder to self, never choose an infantry guy to run with.)). Another was Pemberton. Documented evidence to the contrary, historians believe that Air Power's role in the Civil War was limited to observation balloons and they weren't used at Vicksburg. So, my role was as a Union Cavalry officer. Run around, causing havoc where ever he happened to have the opportunity. Havoc is my middle name. No, I don't have a clue what his name was. In any case, we're walking various battlefields (because the Vicksburg campaign raged from Vicksburg to Jackson and New Orleans to almost Memphis) and at each point, the students whose assigned persona took part in that portion of the campaign would talk about that person's actions, results, accomplishments and mistakes. The first battlefield we visited, mostly because we arrived late in the day, and they wanted to get the terrain walk started, was on the riverfront in Vicksburg itself. We walked a mile or so away from the preserved fortifications and found a trenchline that was more or less intact. So, the folks with speaking parts began speaking, I'm looking around and trying to figure out how anybody knew what was going on. You couldn't see squat for trees and vines and other foliage. Yes, the fighter pilot was learning. 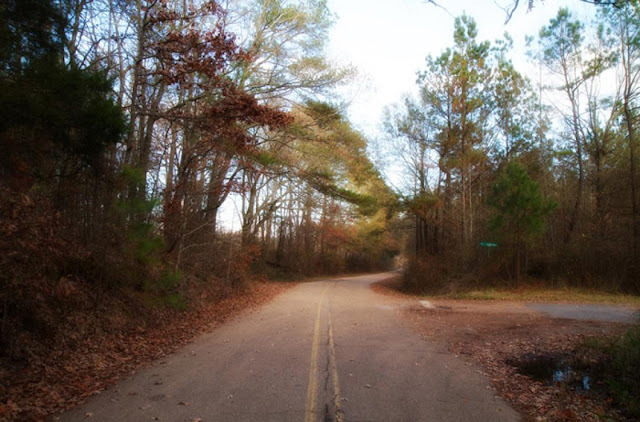 We visited "Grant's Ditch", an attempt to dig a canal that would bypass Vicksburg cutting it off while simultaneously opening up the Mississippi. This engineering feet was conducted on what very loosely was called an island. It actually was a swamp. Yes, it was a terrain walk, we walked in the swamp. No, I wasn't enthused. 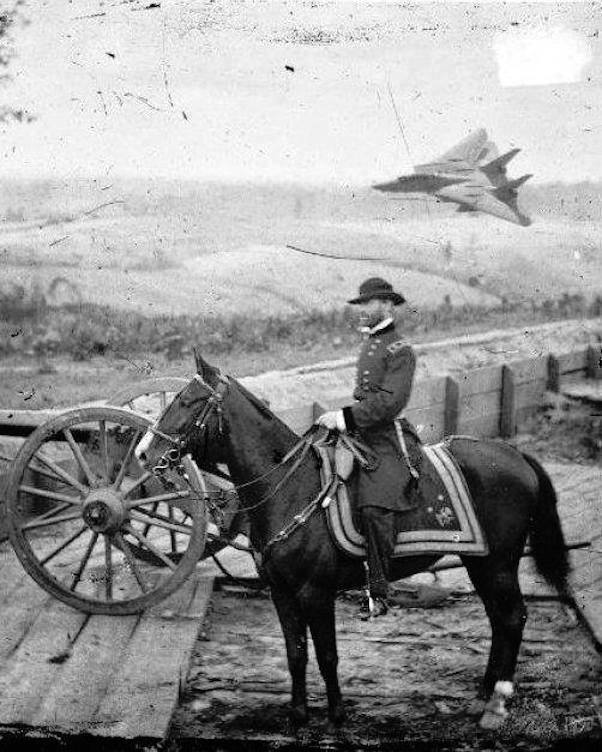 Needless to say, the person charged as Grant's engineer detailed many mistakes and failures. Finally, it's the third and last day and we're going East of Vicksburg about 20 miles (AKA 20 minutes in a bus, about 4 days when marching, fortunately the instructors didn't have 4 days). Grant has three columns moving toward's Pemberton's forces on the high ground known as Champion Hill. At last, poor naive me thinks. We'll be able to see something. Not so much. Also, the road wasn't paved when we were there, it was dirt. Since it had been raining most of the time we were in Vicksburg, it wasn't actually dirt, it was mud. The Army spared no expense to help me experience just how good they've got it. So, we're standing in the mud and driving rain, I give my spiel how the cavalry had spotted a weakness in Pemberton's position which if exploited could split the Confederate forces and allow then to be cut off. Cheers rained from my fellow students as I finished my brilliant analysis which I'd found from the diary of whomever it was I was supposed to be that day and had read to them. We then trudged back down the road to the waiting busses. As I'm slogging along, in the mud and water, I kick my foot against what I think is a rock. My big toe is screaming at me. I fish in the puddle for the offending rock and pull out a portion of what appeared to have once been a sphere about 6 inches in diameter and made of iron, convex on one side, concave on the other. It was the remnants of a cannon ball that had exploded there during the battle. Unfortunately, based on the National Park Services rules, I was not allowed to keep it. Given that my big toe was sprained, I believe, that not only was I the last casualty of Pearl Harbor, but I was also the last casualty of the Civil War. And that's my claim to fame. Yes, this is a rerun from July of 2015. After a couple of days of poetry, I was reading, well, more poetry. Kipling to be precise. Tip of the hat to Andrew for that. Kipling's The Young British Soldier struck a deep chord with me. Now the Brits are allies, faithful and true, no better fighting men anywhere. But once upon a time, twice as a matter of fact, the soldiers of the Crown were our enemies. Oh, do follow that link under the opening painting. The Angry Staff Officer explains the battle from the standpoint of a modern soldier. Good reading, of course, his stuff always is. I've also included a couple of brief videos on the battle at the end. They're good. Now join me as we go back in time to the 17th of June, 1775. 'Tis a warm day, a beautiful day, but for many young lads, 'tis their last day. And I turned my head — and there watching him was the lady that's known as Lou. The woman that kissed him and — pinched his poke — was the lady that's known as Lou. Why yes, yes I was. While there were no timber wolves in the distance, there was a skein of geese which crossed the moon on a frozen night under a full moon. The creak of their wings was the only thing which broke that silence. So yeah, those lines sang to me. Mr. Service was quite a fellow. 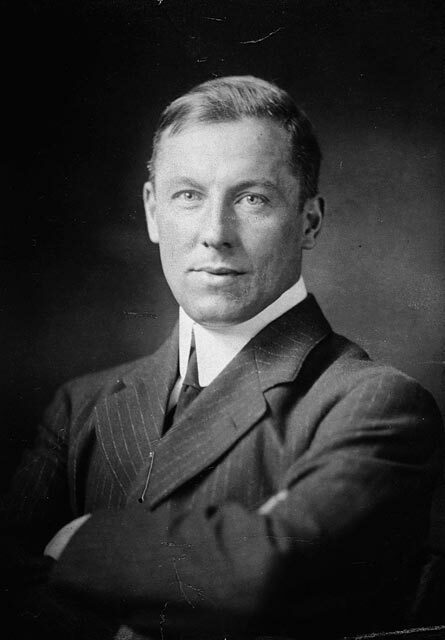 Novelist, poet, aspirations to being a cowboy, volunteered for service in the First World War only to be turned away. Later became an ambulance driver. Though he was born in England, his father was from Scotland and he attended school in Glasgow. So yeah, another Scotsman. No, I'm not trying to turn The Chant into a poetry corner or something, but a little culture has never harmed anyone has it? So I'm doing my bit for culture. Which is my story and I'm sticking to it. Read more about Mr. Service here, quite a fellow. Speaking of snow, we're supposed to get some next Tuesday. I think when I hit 85 I might share his attitude towards the white stuff. Of course, compared to the Yukon, Little Rhody is damned near tropical! Tip o' the hat to Skip for inspiring this post. Did I not mention the fine whiskey that was consumed as well? The sassenachs call it "Scotch," we Gaels just call it whiskey. Burns Night isn't the same without a wee dram, for the cold of the night dontcha know? 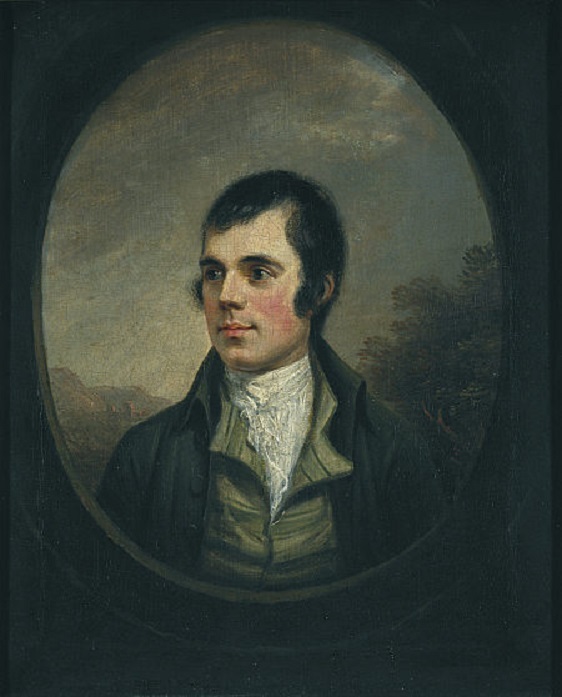 Now Robert Burns is the national poet of Scotland and some (especially those wearing kilts) would say that he was the greatest poet who ever lived. But I'm letting my Gael show, aren't I? Wha can fill a cowards’ grave? While Grim has a nice take on what is and isn't a "gentleman," he leans towards the courteousness required when everyone is armed and being rude might get you shot/stabbed/bludgeoned, I had to dig a bit further. After all, in Japan one is polite because of hundreds of years of tradition, which in olden times kept you from getting beheaded by a samurai because you looked askance at him. Yes, everyone was polite to avoid that. Especially if you were not a samurai. 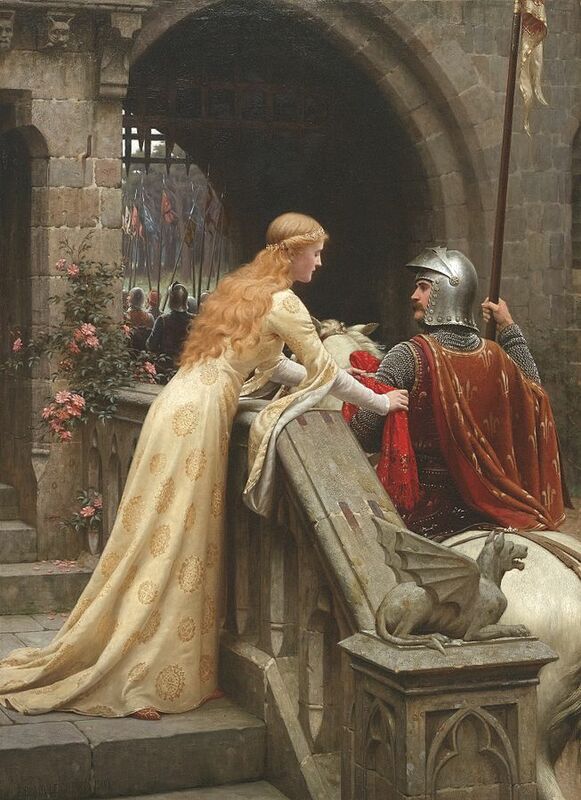 "I fought against the cream of French chivalry"
"their relations with women were models of chivalry and restraint"
We usually associate the term chivalry with the medieval knight, it was the concept they were supposed to embody, to live up to. Often, they did not. Many knights were coarse brutes, so troublesome that the Crusades were allegedly dreamed up to get them to go recover the Holy Land from the infidel. And take their troublesome ways with them. If you look through those "commandments," you can see that there is good stuff contained therein. You're supposed to be a Believer and follow and defend the Church. Defend the weak, love thy country, no cowardice in the face of an enemy, etc., etc. We need (and used to have) a religious, moral, and social code. Most of the problem with the world today is a lack of morality, a lack of civility. Damn it, good manners are lacking. Well, the caption from af.mil says "Ready for anything." Except apparently to obey Congress. Yeah, yeah, I know, it ain't the kids in the photo. They're out in the field with the grunts, calling in Warthogs to put "warheads on foreheads," no, it's those perfumed princes in the five-sided puzzle palace on the Potomac who have, apparently, crapped the bed. Again. Congress wants to keep the A-10 flying. Lawmakers have repeatedly demonstrated their commitment to maintaining a dedicated ground attack aircraft and, more importantly, an effective close air support capability. They have done so through legislation in successive National Defense Authorizations Acts since 2013. In the most recent NDAA, Congress authorized $103 million for the Air Force to complete the job of installing urgently needed new replacement wings on the A-10 fleet. But a senior Air Force official recently told a meeting of A-10 personnel that the Air Force has no intention of fully implementing the re-winging effort and has no intention of keeping any more A-10s flying than the 171 that have already been upgraded, thus thwarting Congressional intent and legislation. The key bit is in bold italic. Reading the article, I see that the "senior Air Force official" is a civilian, no doubt backed by a number of flag officers. I guess the old A-10 ain't glamorous enough for some people. We don't need glamour, we need effective weapons systems which can take the fight to the enemy and make those sumbitches regret the day they took up arms against the U. S. of A. The Air Force has changed since I walked the flight line last (which was 1982). When I became an office puke (computer programmer) I didn't miss the weather and the long hours out on the line. I did truly miss the maintainers and the air crews, what I always called "the Real Air Force." No glamour, just hard, rewarding work. Perfumed princes, they're why we can't have nice things. If it were up to me, heads would roll, stars would fall, and more than a few careers would end. But it ain't up to me. More's the pity. For once (he said in disbelief) I agree with Congress. Yeah, I had the opportunity to take a guided tour of the Okinawa Battle. It started offshore in a landing craft and came ashore on the beach. It was an interesting experience to be standing there, with your nose at the ramp and hear the bottom hit the beach. The realization that, if this were real, your life expectancy was probably measured in seconds was "educational" to say the least. I always wondered how I'd react, hence the prayer. I can imagine. Or, maybe, I can't imagine. About every two years I read the official US Army documentation on the invasion. And I can, in my mind, walk in their steps, remembering where I was, what was there at the time I was. Sobering. At the end of the island-island before you got to the 'we added extra room on the island-island' there is/was 'Bunker Hill' which was a Jap concrete command post where the US forces had to do unthinkable things in order to secure it. So strongly built they just covered it up and left it in place. No ghosts there. We played on it during the day, but come dusk the general feeling was decidedly creepy. Visited Cape Canaveral one year on a tour, which included the Apollo 1 launch pad. Their ghosts haunt that place, too. I don't think I can handle going to someplace like Iwo or Okinawa or the trenches in France. Cold, windy places, no matter the time of the year. Visited Ypres while visiting NATO HQ on a trip to Sarajevo in 97. There was a Museum set up with intact trenches that you could travel down. Couldn't do it. Could walk along and look in, but walk in as if I were there, no way. When I was less than 3, my Dad and Mom were stationed at Naha AB Okinawa. There quarters were on Suri Ridge. Mom, later, said she wouldn't let me play outside unless she was there. Heck, EOD was still active when I was there 35 years later. Mom also said she didn't like being outside after dark. Said it was just too eerie. So, yeah, I understand where you're coming from. Andrew and Juvat were talking of places where combat took place, where men (and often women and children, especially on Okinawa) died, in horrible ways. Places they had been and experienced long after the day of battle. They haunt me. Sometimes they haunt my dreams, perhaps I read too much military history. I have studied warfare for as long as I can remember. The great battles and campaigns, the generals, the admirals, and (especially) the common folk who actually go forth into battle. The ones who spill their blood (and more, for battle is a very messy experience), the ones you seldom read about unless they are decorated for bravery. 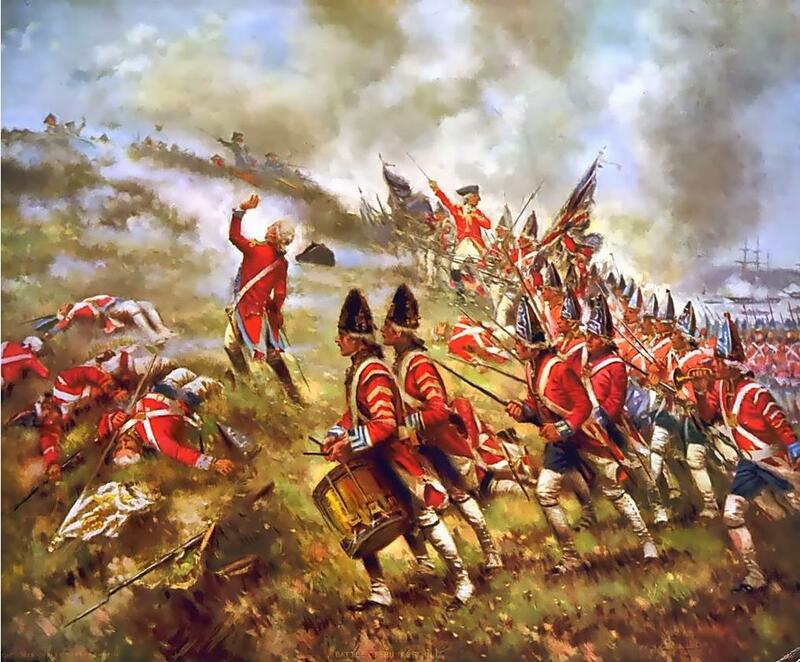 Most Americans of my generation are familiar with Fort Ticonderoga from our Revolution, seized by a small band of men led by Ethan Allen and Benedict Arnold. The latter fellow was a pretty fine leader until he let his ego and lust for position override his common sense. The Battle of Saratoga would no doubt have turned out differently had General Arnold not been there. We won due to his bravery on that field. I won't judge him, I wasn't there when he turned his coat and betrayed the fledgling United States. Unless you've "been there, done that" it's hard to understand what motivates a human being in times of high stress and the nastiness of battle. 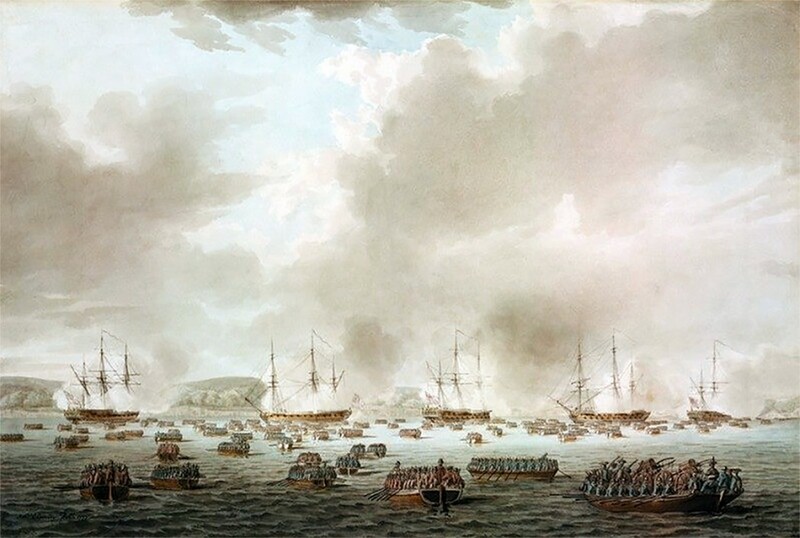 But Ticonderoga (then held by the French and known to them as Fort Carillon) was the scene of a vicious fight during the French and Indian War. 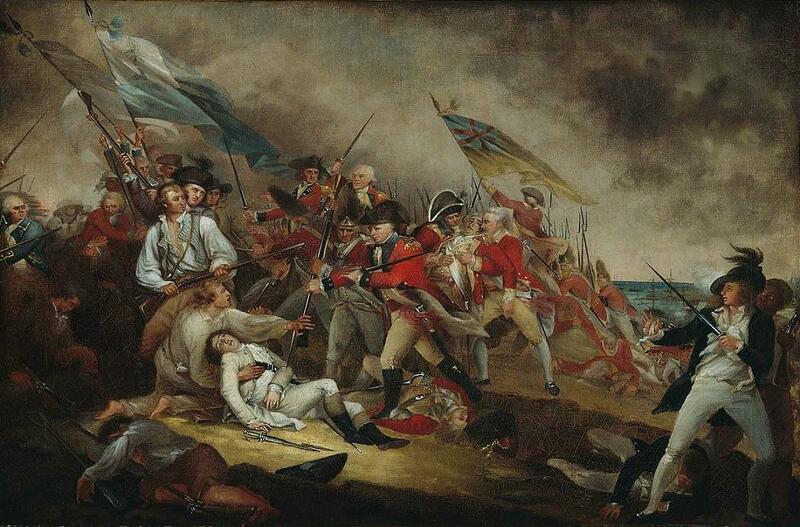 George Howe, brother to Admiral Richard Howe and General William Howe (both of whom you should know from the American Revolution) was killed in action there in July of 1758. 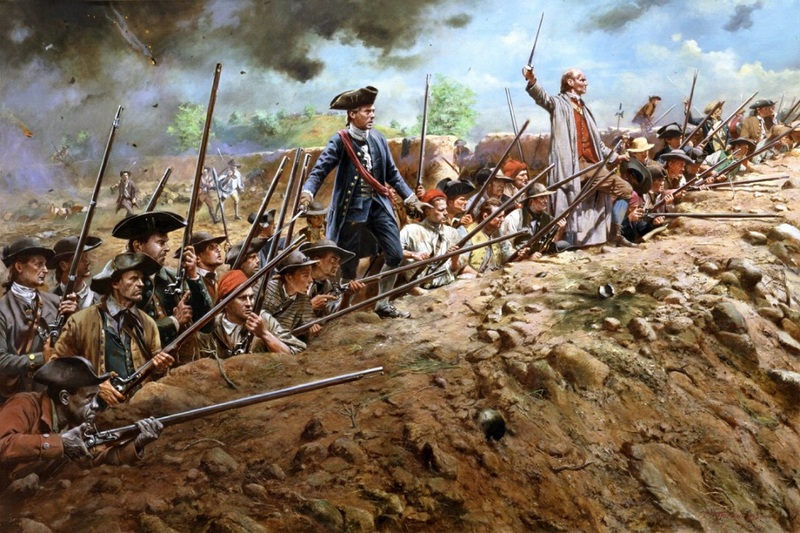 When the Green Mountain Boys, commanded by Allen and Arnold, got there in 1775 it was undermanned, though still an important post. It was taken without a fight. I've stood on the reconstructed ramparts of that fort, walked the forests surrounding it, I swear I could hear the echoes of ancient days in those rugged hills south of Lake Champlain and north of Lake George. It makes the hair on the back of my neck stand up even now. The Battle of The Hürtgenwald was a nasty fight fought in miserable weather starting in September of 1944 and running right up to the start of the Battle of the Bulge. My great uncle John was an infantryman in the 4th Infantry Division there. His war ended during that battle, wounded by a bullet which pierced his helmet and grazed his scalp. Rattled him badly, probably concussed, he was evacuated. By the time he recovered, the war was over. In the same battle the father of a NATO colleague of mine was captured. His war was over as well. Good thing, my colleague's Dad was an infantryman of the German Wehrmacht. I still have Uncle John's helmet, the hole in it is a constant reminder of how close we stand to eternity. I have walked the area, taking pictures so that my uncle could see what it looked like now. Not the same on a pleasant sunny day in summer. I should have gone in the fall, in the rain. But no one in their right mind would visit those ravines in a wet German autumn. Yet men were expected to fight there in 1944. Now Bastogne, Elsenborn Ridge, Stoumont, La Gleize, and Krinkelt-Rocherath are all battles fought within the larger Battle of the Bulge. One must be careful walking the woods in that area. They still find unexploded ordnance and human remains 74 years later. As they do in many places in the world where hubris and greed have led our species to wage war upon each other. Quatre Bras and Waterloo are, of course, two of the battles fought in Napoléon Bonaparte's last military campaign. 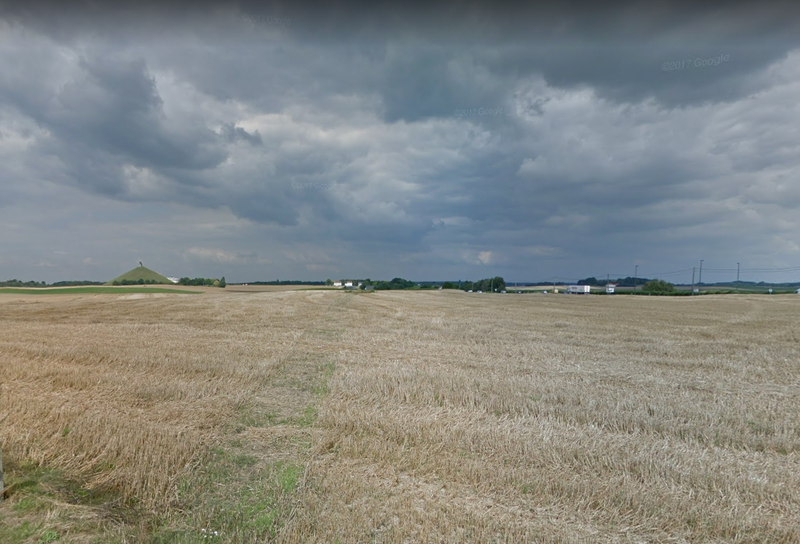 I have walked both areas, though I concentrated on Waterloo due to the field being relatively well-preserved as opposed to the other. Quatre Bras, Ligny, and Wavre were the other three battles of that campaign. Waterloo gets all the press, it was where Napoléon's imperial ambitions were finally crushed. The other three battles are often forgotten. Waterloo haunts me like no other place on this earth. Upwards of 40,000 men (and perhaps a lady or two disguised as soldiers, it happened more often than many historians acknowledge) fought and died there, or later of their wounds. At least 10,000 horses perished as well. All in an area no greater than five square miles. That's more than one dead or wounded soldier for every square yard! In reality the areas upon the field where the fighting was heaviest were very small. Afterwards one visitor from Brussels said that one could walk across the field without stepping on the ground, the corpses were so thick. The area surrounding the battlefield has changed since I was last there in 1998, two new parking lots (at least) have been added to accommodate the tourists. While one of these new "car parks" was being dug up in 2012, a nearly complete skeleton was unearthed. The ball which killed him still embedded in his rib cage. Historians believe the man was a German soldier, named Friedrich Brandt. A Hanoverian serving in what was known as the King's German Legion. You can read about Soldat Brandt here, here, and here. But who was this soldier? Apparently he left no relatives behind, no wife to claim a widow's pension, no grieving parents to mourn him. He had a pronounced curvature of the spine, which would disqualify someone from service in a modern army. But in those days if you could shoulder a musket and your pack, and stay in ranks, then that was good enough. Perhaps he was a farm laborer, perhaps he had no trade, no family, no prospects other than to join the army (it still happens today). But whoever he was, whatever his history, he marched to Waterloo in the army of the Duke of Wellington. A member of du Plat's brigade stationed on the Allies right flank. When his battalion was ordered forward, he marched with his comrades into the smoke and fiery hell of battle. At some point he was hit, he may have staggered forward another pace or two, he may have dropped to his knees instantly. Gasping for breath perhaps, unsure of what had just happened. If he noticed at all, he would have seen his mates continuing on without him, vanishing into the smoke. We do know that his brigade commander, Colonel Georg Carl August du Plat was also hit that day. 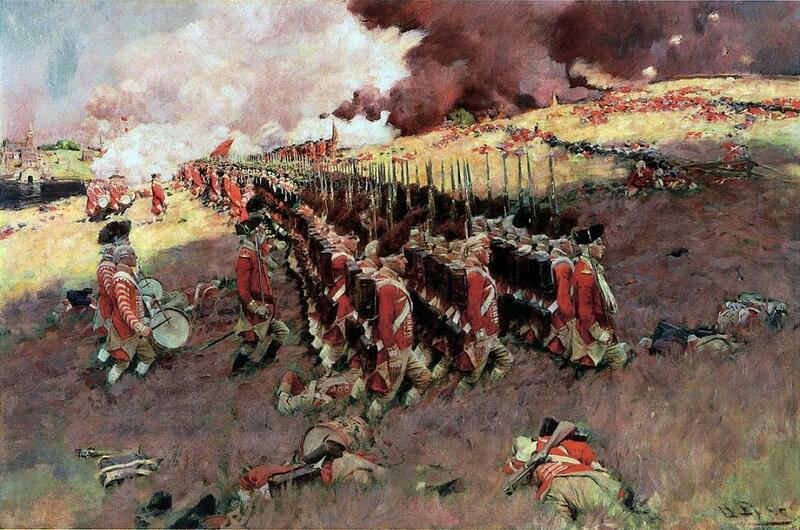 The colonel lingered on only to die of his wounds some three days after the battle. Undoubtedly Soldat Brandt laid there on the field until he died. After the battle he was no doubt stripped of his possessions, probably his uniform as well, and dumped naked into a mass grave with the multitude of other dead men in the immediate area. Remember, there were thousands of them. There his body lay for 197 years. It is the duty of the living to remember the dead. At least that's how I see it. So, rest in peace Friedrich Brandt, rest in peace soldier, your duty is done, you are not forgotten. 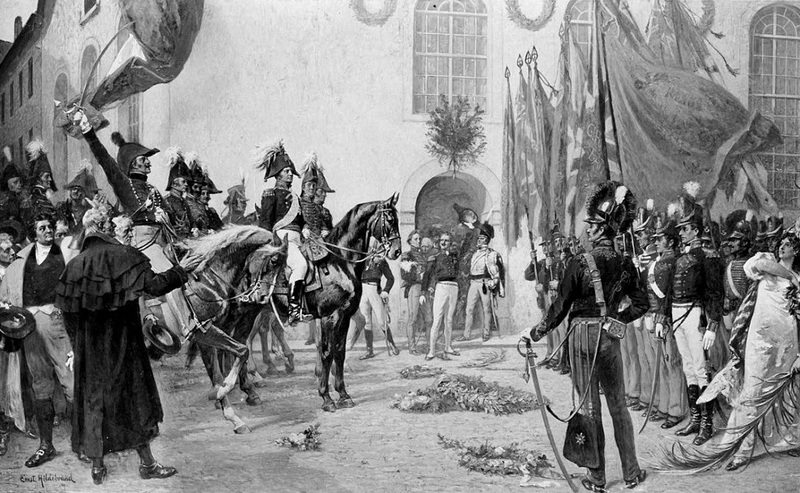 The King's German Legion returns to Hanover in 1816. Friedrich Brandt was not among them. It's been a while since I pulled out this photo and looked through the list of names. This project has been satisfying for me. I now recognize virtually all the names and can describe most of the justification for their being so honored. But there are still a few, and in researching this post's legend, I learned quite a few things that I hadn't known. For instance, which mission that the Air Force (yes and its antecedents) flew resulted in the most Medals of Honor being awarded? Ploesti. 5 Medal's of Honor, 3 posthumously. Second question. What was the first target in Europe bombed by the US Army Air Forces? Ploesti. June 11, 1942, 13 B-24s launched to attack the city. 1 aborted after takeoff with fuel issues, the other 12 attacked. Minimal damage was achieved, 6 aircraft recovered as planned in Iraq, two in Syria and the other 4 were interned in neutral Turkey. I did not know that one. So, I scored a 50 on that pop quiz. Bummer! I arrived at the subject of today's post, based mostly on a recent comment from Andrew, our classically trained rantconteur (yes, I know that is not an actual word, Google, but it better fits the man than raconteur), In which he asks (paraphrased) how we could have such a large fleet in WWII and still have had a lesser number of feckless and ill-trained captains than we do now? My mind pondered about my service and agreed that the situation is very similar. The example that popped into my cranial vault was Ploesti. Intricately planned, but plagued by bad luck. Checkpoints missed, weather, mechanical problems all contributed to the chaos of the mission, and that was all before they encountered enemy opposition. However, perseverance and leadership salvaged what success could be had from the situation. I'll be discussing one of the Medal of Honor Recipients who survived the attack and indeed the war, Colonel John R. Kane. There's something to be said for this picture. I knew as soon as I saw it, he was not a "perfumed princess". Col Kane was born in 1907 and joined the AAF in 1932. He arrived in Africa in July of 1942 and over the next year received 3 of the top 4 Military awards for Valor. He received a Distinguished Flying Cross for actions taken in an Attack on the Harbor at Naples that sunk a cruiser and battleship and a Silver Star for out flying a ME-110, denying him a successful shot until the ME-110 had run out of ammunition and returned to base. 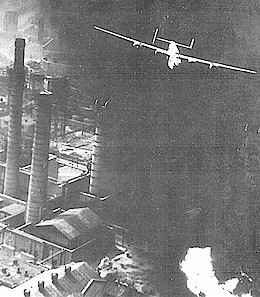 On August 1, 1943, 178 B-24s launched from Libya on the attack most people think of when Ploesti is named. As mentioned earlier, bad luck was plentiful, with aborts enroute as well as a couple of actual crashes. Weather and a difference in procedures, caused the attack to unintentionally be split into two waves. 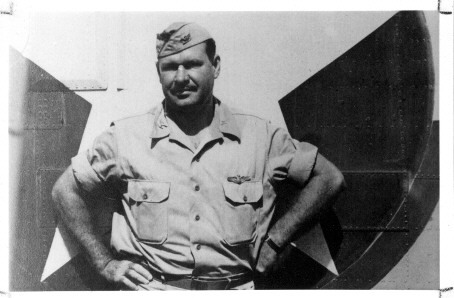 Col Kane's flight approached their target area approximately 60 miles behind the lead elements. The element of surprise was lost. In addition, their route followed a railroad line into the city. Unbeknownst to them, the German commander had positioned a AAA railroad train on it. Col Kane had modified his bomber with 3 .50 cal machine guns in the nose that could be fired from the cockpit. He shot all 2500 available rounds on ingress. Unfortunately, the target area had been attacked by an earlier flight that had missed their target. The gunners were alerted, but also, smoke and flames from burning petroleum added to the confusion and danger. Col Kane continued his attack and eventually dropped his bombs on their target and began their egress. During the attack, Col Kane's B-24 had been hit 20 times by AAA as well as countless small arms rounds. He'd also lost an engine. Fuel was too low to allow a return to Libya, the nearest reachable recovery base was 900nm away on Cyprus. Col Kane decided to violate Turkish Airspace and fly direct to Cyprus. On landing, he hit an unreported wall, and the aircraft was badly damaged, however the crew egressed successfully. The bomber was scrapped. 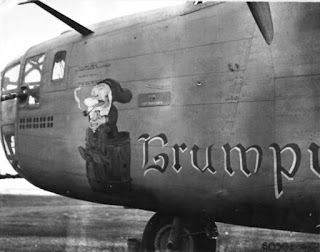 The source says this is the picture of Col Kane's bomber, although reports from the mission said he was flying "Hail Columbia". 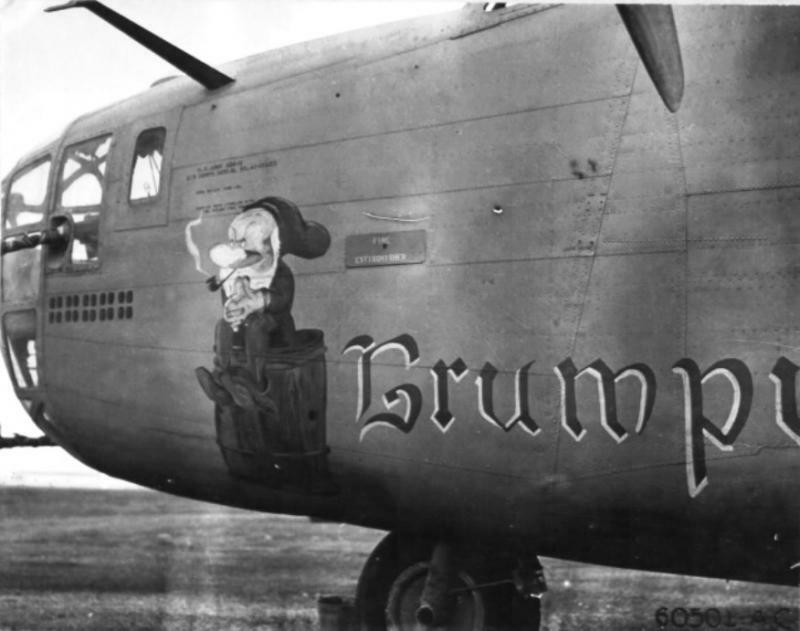 Update: This source says, at the time of the picture, it had been transferred to a different squadron which used Snow White names as a naming protocol, later it was transferred back to the original squadron, and when it flew the Ploesti mission, it was renamed "Hail Columbia". A final bit of knowledge about this attack of which I was unaware. I had never heard about any reattacks of the target after this one. Evidently, it was frequently attacked up until Romania surrendered in late August 1944. You might recognize the Narrator's voice. I found this picture of Col Kane and immediately recognized the man. A strange resemblance to the man in the masthead above, bottom row, third from the left, no? Col Kane resigned from the Air Force in 1954 and passed away May 29, 1996. "I still recall the smoke, fire and B-24s going down, like it was yesterday... Even now, I get a lump in my throat when I think about what we went through ... I didn't get the Medal of Honor. The 98th did." Nope, not a perfumed princess. Warrior! For conspicuous gallantry in action and intrepidity at the risk of his life above and beyond the call of duty on 1 August 1943.On this date he led the third element of heavy bombardment aircraft in a mass low-level bombing attack against the vitally important enemy target of the Ploesti oil refineries. En route to the target, which necessitated a round-trip flight of over 2,400 miles, Col. Kane's element became separated from the leading portion of the massed formation in avoiding dense and dangerous cumulus cloud conditions over mountainous terrain. Rather than turn back from such a vital mission he elected to proceed to his target. Upon arrival at the target area it was discovered that another group had apparently missed its target and had previously attacked and damaged the target assigned to Col. Kane's element. Despite the thoroughly warned defenses, the intensive antiaircraft fire, enemy fighter airplanes, extreme hazards on a low-level attack of exploding delayed action bombs from the previous element, of oil fires and explosions and dense smoke over the target area, Col. Kane elected to lead his formation into the attack. By his gallant courage, brilliant leadership, and superior flying skill, he and the formation under his command successfully attacked this vast refinery so essential to our enemies' war effort. Through his conspicuous gallantry in this most hazardous action against the enemy, and by his intrepidity at the risk of his life above and beyond the call of duty, Col. Kane personally contributed vitally to the success of this daring mission and thereby rendered most distinguished service in the furtherance of the defeat of our enemies. * Attributed to Col Ted Timberlake, Chief Operations Officer for the Attack, on being told he could NOT go on the mission as he knew too much about Allied Plans to be risked. I understand the sentiment. Sources: My Primary Source is, once again, Home of Heroes. Always a good read there. Where Are My Effing Gloves? It's a Matter of Taste, Innit?